Quixote and Sancho is the directorial debut of Oksana Mysina, one of the top stars of the Russian stage today. She also plays one of the leads in the production — Sancho Panza. It is a magical ritual, in which all the components — light and music, gesture and word, costumes and props — work as metaphors. Oksana Mysina sought to reach into the essence of the poetry of theater, to bring to-gether that which cannot be brought together — imagination and reality; the eternal themes of love and death and an ultra-contemporary theatrical language; the grotesque and the philosophical parable; the metaphysical and the intuitive; psychology and clownery. The production consists of many genres at once. It contains elements of the commedia dell?arte, circus tricks and operatic arias. And yet it is a coherent work that is founded on the great tradition of the Russian naturalist school. The plot does not follow Cervantes?s novel, bur rather employs some of its motifs in a cursory fashion (e.g., the battle with the windmills). Even the echoes of the novel, how-ever, are presented in a completely new form. 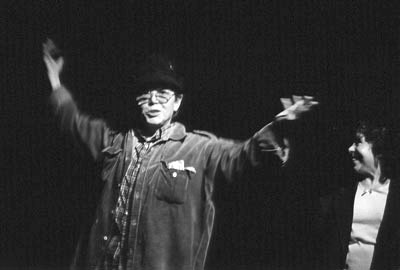 The poet and playwright Viktor Korkiya originally established his fame with the play The Mystery Man, or, I am Poor Soso Dzhugashvili, a tragifarce about Joseph Stalin. In Qui-xote and Sancho, he composed a poetic parable about a journey into the Depths of the Soul; that is, about human life. What follows is a brief summary in the words of the author. Sancho begins to dream and, before our eyes, his dreams begin coming true. But now he discovers that any dream come true is quite unlike the imagined ideal. He understands that good and justice mean nothing if you yourself are not loved. He understands that you can remake everything (for example, you can rename your donkey Mercedes), but you cannot remake human nature. Sancho is in despair. He is prepared to kill Don Quixote for having revealed to him the tragic underpinning of life. But Don Quixote dies and Sancho realizes a new truth: The death of a dreamer imparts eternal life to his dreams. This death, which comes to Don Quixote quite literally as a pale Biblical horse, turns out not to be the common death of a common man, but a rebirth into a new life. The heroes of this production exist simultaneously in reality and in a world of their own imagination. The transitions from one state to another are abrupt and unpredictable. The action takes place in the here and now, and it also takes place in eternity. It takes place in the contemporary world as well as in historical time. As such, the finale of the production has a festive feel to it. This is no notorious Holly-wood happy end, but rather is a metaphor for life which is capable of defeating death, for a life that is inspired by love.